What I dubbed the Obama administration's "rapid and harsh turn against Israel" has had three quick, predictable, and counter-productive results. These point to further difficulties ahead. A complete stop to building by Jews in eastern Jerusalem and the West Bank. Palestinians and Americans are the intended audience for this preemptory list; such exorbitant demands, the record shows, only reduces Israeli willingness to make concessions. 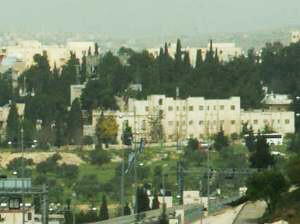 The former Shepherd Hotel in eastern Jerusalem. Second result: The U.S. government takes marching orders from Abbas and passes them along to the Israelis. Abbas complained to the Americans that the construction of 20 apartments and an underground garage in the eastern Jerusalem neighborhood of Shimon Hatzadik, 1.4 kilometers north of the Old City, would shift Jerusalem's demographic balance. The State Department promptly summoned Israel's ambassador to Washington, Michael Oren on July 17 and instructed him to halt the building project. Some background: Zionists founded the Shimon Hatzadik neighborhood in 1891 by purchasing the land from Arabs, then, due to Arab riots and Jordanian conquest, abandoned the area. Amin al-Husseini, Jerusalem's pro-Nazi mufti, put up a building in the 1930s that later served as the Shepherd Hotel (not to be confused with the renowned Shepheard's Hotel in Cairo). After 1967, the Israelis designated the land "absentee property." Irving Moskowitz, an American businessman, bought the land in 1985 and rented the building to the border police until 2002. His company, C and M Properties, won final permission two weeks ago to renovate the hotel and build apartments on the land. Third result: The U.S. demand has prompted an Israeli resolve not to bend but to reiterate its traditional positions. Oren rejected State's demand. Prime Minister Binyamin Netanyahu, who confessed to being "surprised" by the U.S. demand, assured colleagues "I won't cave in on this matter." Publicly, Netanyahu closed the door on concessions. Insisting that Israeli sovereignty over Jerusalem "cannot be challenged," he noted that "residents of Jerusalem may purchase apartments in all parts of the city" and pointedly recalled that "in recent years hundreds of apartments in Jewish neighborhoods and in the western part of the city have been purchased by – or rented to – Arab residents and we did not interfere. "This says that there is no ban on Arabs buying apartments in the western part of the city and there is no ban on Jews buying or building apartments in the eastern part of the city. This is the policy of an open city, an undivided city that has no separation according to religion or national affiliation." Then, his blistering finale: "We cannot accept the idea that Jews will not have the right to live and purchase in all parts of Jerusalem. I can only describe to myself what would happen if someone would propose that Jews could not live in certain neighborhoods in New York, London, Paris or Rome. There would certainly be a major international outcry. Accordingly, we cannot agree to such a decree in Jerusalem." Foreign Minister Avigdor Lieberman asserted this same point while Yuli Edelstein, minister of Information and Diaspora, added that the U.S. demand "proves how dangerous it is to get dragged into talks of a settlement freeze. Such talks will lead to a demand to completely freeze our lives in the entire State of Israel." From May 27, when the Obama administration began its attack on Israeli "settlements," it has displayed an unexpected naiveté; did this administration really have to relearn for itself the well-known fact that Washington fails when bossing around its main Middle Eastern ally? It then displayed rank incompetence by picking a fight on an issue where an Israeli consensus exists – not over a remote "outpost" but a Jerusalem quarter boasting a Zionist pedigree back to 1891. How long until Obama understands his error and retreats from it? How much damage will he do in the meantime? July 27, 2009 update: For a reliable account on the disputed site, see Nadav Shragai, "The U.S.-Israeli Dispute over Building in Jerusalem: The Sheikh Jarrah-Shimon HaTzadik Neighborhood." July 28, 2009 update: For a slight geographic correction to my account, see the comment by Elliott A. Green, "Clarification about Shimon haTsadiq quarter." The Obama administration created a loud diplomatic flap with Israel two weeks ago over another construction project in Jerusalem, accusing Israel of purposely announcing the approval of 1,600 housing units at Ramat Shlomo in order to embarrass visiting Vice President Joe Biden. It remains to be seen whether the announcement regarding the Shepherd Hotel will lead to similar indignation by the US. No less likely to protest is the British government, which is particularly sensitive about the project because it is located next to the British consulate. Jan. 9, 2010 update: Bulldozers pulled down Shepherd Hotel except for the facade. U.S. secretary of state Hillary Clinton announced that this is a "disturbing development." 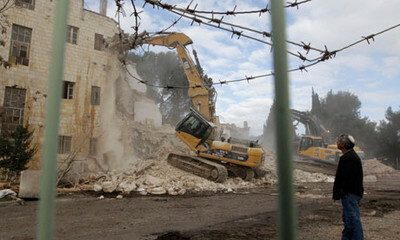 Bulldozers tear down part of the Shepherd Hotel, Jerusalem. Related Topics: Arab-Israel conflict & diplomacy, US policy | Daniel Pipes receive the latest by email: subscribe to the free mef mailing list This text may be reposted or forwarded so long as it is presented as an integral whole with complete and accurate information provided about its author, date, place of publication, and original URL.